We are plumbing professionals who treat you like family. Honest & Up-front Pricing. We charge by the job, not by the hour, so there are no surprises. Highly-trained & Qualified. Our plumbing experts are certified, licensed, bonded and insured in the plumbing field for your protection and peace of mind. Professional. Our licensed and knowledgeable plumbing experts show up within the two-hour time window we set with you. Compassionate. We pride ourselves on treating you like family, and treating your home like it’s our own. As a family owned company, we are committed to building strong relationships with all our customers. 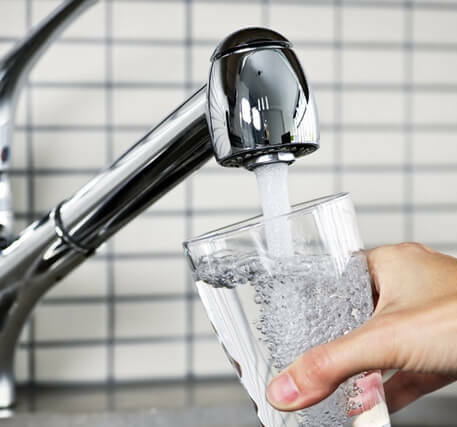 Our goal is to provide top quality plumbing services using the highest quality materials and most advanced technology to accurately diagnose plumbing problems. We get in, get the job done and get you back to your life! At Green’s Plumbing, we are constantly looking for new ways to make our services more convenient and cost-effective for you. We’re not just in it for the money. We will never recommend a replacement if the plumbing issue can be solved with more affordable repairs. You’re always the one in charge. We have a no pressure policy that ensures you are given all the options before we move forward. We provide 100% satisfaction guarantee. Upon completion of every project, we make sure that every customer is happy and satisfied with our work. 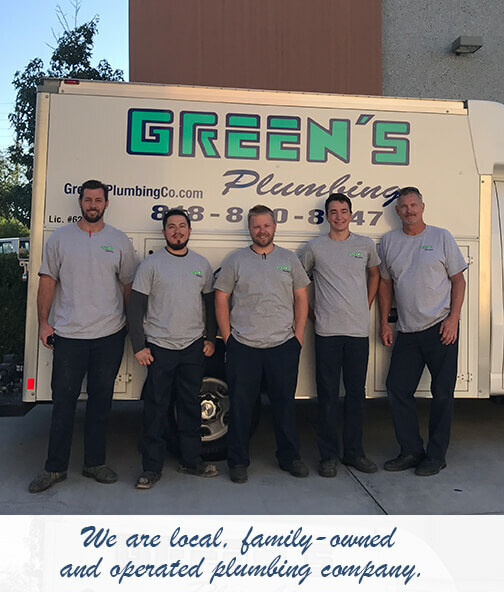 Whether you need toilet repairs, drain cleaning, water heater replacement or any other residential plumbing service, you can trust the highly trained experts at Green’s Plumbing. We will keep your pipes running smoothly so that you can focus on life’s more important matters. When it comes to keeping your home comfortable, the proper working function of its plumbing systems is paramount. When problems arise, it’s important to call a professional residential plumber as soon as possible. For over 27 years, Green’s Plumbing has built a reputation on honesty and integrity, and as a local and family owned plumbing company that offers top-quality plumbing services to all our customers. We also provide you the peace of mind of knowing that we are conscientious and respectful of your home. Call Us for a FREE estimate - (818) 880-8847! From leaky pipes to drain cleaning and everything in between, trust Green’s Plumbing to resolve all your plumbing problems quickly and efficiently. We show up on time and we do what we say we are going to do every time! We also offer FREE inspection for all our loyal customers in West Hills, Woodland Hills and surrounding areas within the San Fernando Valley. 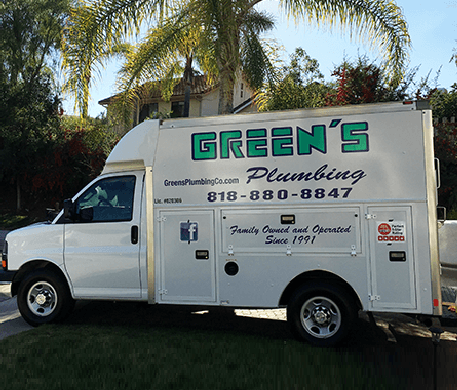 If you need help from professional, licensed and insured, call Green’s Plumbing, your West Hills plumber, to schedule a FREE estimate today at (818) 880-8847. Whether your existing water heater is malfunctioning or you’re ready for an upgrade, Green’s Plumbing is the right West Hills plumber for the job. We repair and install energy-efficient, tankless water heaters for your home. No matter what your plumbing problem is, Green’s Plumbing is here to help. Call us today (818) 880-8847 to speak with one of our licensed experts about your plumbing needs.